Written by Jean Hinman on April 15th, 2014 February 14th, 2018 . Blood Drive and Sign up to be a Potential Bone Marrow Donor: easy as swabbing your cheek and filling out a few forms. Either sign up to make a reservation for yourself to give blood or walk in! Ascension does this 4 times a year and we have one of the BEST records!!! (Reserve an appointment to give! Please make sure to eat, be well hydrated and bring identification with photo or signature. Why Give Blood? Community Blood Center must collect almost 600 units of blood daily to meet the needs of area hospital patients. As there is no substitute for blood, we rely on volunteer donors like you to supply the life-saving blood and blood components to hospitals in Kansas and Missouri. Making an appointment is easy! Simply click here and follow the steps below. BLOOD DRIVE WE NEED DONORS! How do we respond to the blessings God has bestowed on us? How do we deal responsibly with the gifts God has given us? To think only of ourselves is to squander our lives. But to respond gratefully means we praise God with our lips and our actions. To respond gratefully is to realize that all of life is God’s, and we are called to care for it and share it. With these thoughts, we ask you to consider giving so that others may live. A 2007 University of Minnesota study estimated that about one third of the U.S. population is eligible to donate blood. However, the number of people who actually choose to donate is far fewer. Currently, the Kansas City-based Community Blood Center, which provides seventy area hospitals with 3,600 units of blood each week, describes its supply as critical; meaning the supply for hospitals and patients is stretched thin. This limits elective surgery and can postpone life saving treatments. One seventh of hospital patients will require a blood transfusion. Patients undergoing organ transplants, anemic patients, some patients undergoing chemotherapy treatment, premature infants, and patients who have lost blood due to injuries all need blood donations, and blood donors, to survive. Compared to the massive benefits that result from giving blood, the actual process is easy. After filling out medical paperwork, prospective donors meet with staff to undergo a brief physical exam. If the donor is eligible, the period where blood is extracted takes about ten minutes. Afterwards, donors can sit, rest, eat snacks and rehydrate. 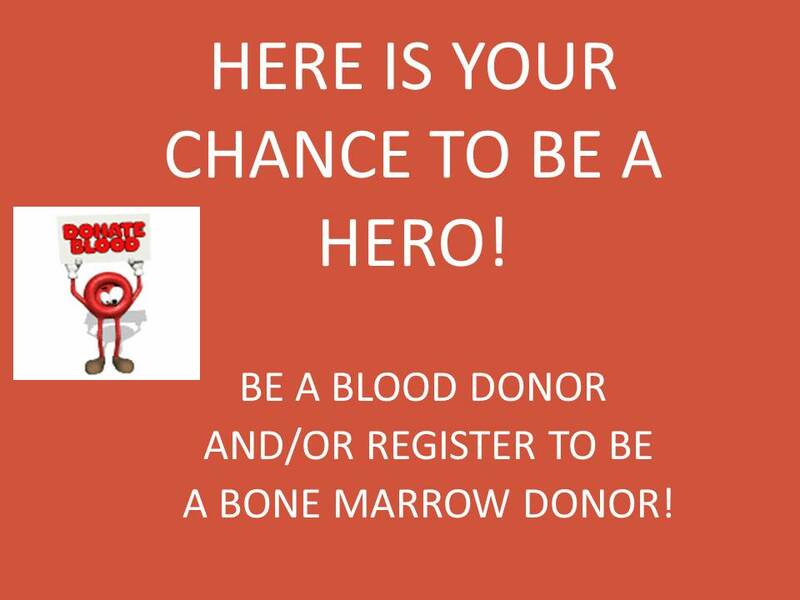 You can register to be a potential bone marrow donor: Info on Bone marrow donation. 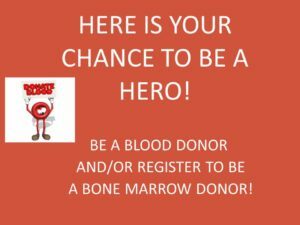 Can you imagine how AWESOME it would be to be the donor of bone marrow and save a kid or adult from dying from leukemia? MAY OUR FAITH FILL US WITH THE COMPASSION TO DONATE LIFE! Every major religion in the US supports organ, eye, and tissue donation as one of the highest expressions of compassion and generosity. Donation allows you the opportunity to give someone the hope of restored health, sight, and mobility. Consider giving that hope to the more than 120,000 people in need of lifesaving organ transplants and the hundreds of thousands more in need of corneas and tissue. On average, a single organ or tissue donor can save or enhance the lives of up to 50 people. Approximately 28,052 patients began new lives last year thanks to organ transplants. Almost two thirds of all living donors are relatives of their recipient, most commonly siblings. The number of unrelated living donors has more than tripled since 1998. People of all ages and medical histories should consider themselves potential donors. 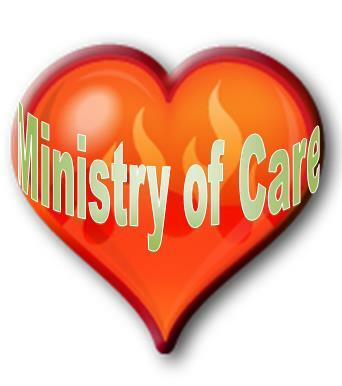 Your medical condition at the time of death will determine what organs and tissue can be donated.